QUIZ: Do You Think Like a Cook? Welcome to Cooking 101, a fun, weekly series of cooking lessons and hands-on learning from America's Test Kitchen. Who are we? Our knowledge and techniques are based on 20 years of test kitchen work creating foolproof recipes for Cook's Illustrated magazine and for our television shows. 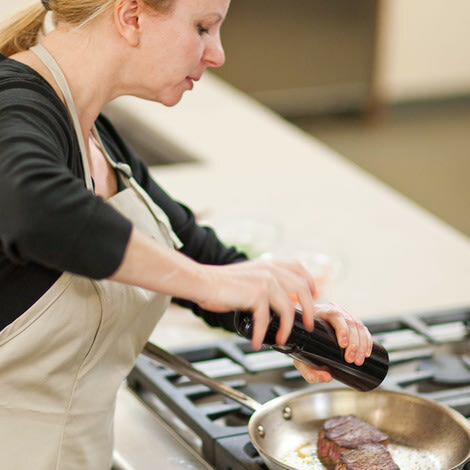 We believe that everybody, whether novice or advanced, can gain the skills and confidence to become a better cook. Do you know how to think like a cook? Knowing how to read a recipe is key to success in the kitchen, but recipes are often written in their own language and require deciphering by the cook. For example, do you know the difference between "minced" or "chopped fine"? How does one get the most accurate reading in a liquid measuring cup? And what is a shallow-fry, anyway? Take this quick quiz and improve your knowledge of recipe and cooking concepts. A. You should chop the nuts and then measure them. Because the volume of ingredients is different when chopped, when you measure really matters. 2. At what temperature is food sweated? A. Food is usually sweated over low or medium-low heat. To sweat is to cook over gentle heat with a small amount of fat in a covered pot. 3. To keep butter from burning, which should you add to the pan? A. To keep butter from burning, add a small amount of vegetable oil. With its higher smoke point, vegetable oil is more resistant to burning and will help keep the butter from burning. 4. If food is too salty, which should you add? A. To mask an overpowering salty flavor, you should add an acid or sweetener. 5. If your sauce or soup is too thin, which should you add? A. Soups and stews can be thickened with cornstarch, provided it is first dissolved in a small amount of cold water to prevent lumps. 6. Which should you not prepare in advance? A. Chopping garlic and onions releases sharp odors and strong flavors that become overpowering with time, so it's best to cut them at the last minute. 7. Which should you add to lean proteins to accelerate the browning process? A. A pinch of sugar sprinkled on lean proteins (chicken and seafood) or vegetables speeds up the browning process. 8. Which salt should you use for seasoning meat? B. The large grains of kosher salt distribute more evenly than fine table salt, making kosher salt the best choice for seasonings proteins before cooking. 9. Which should you add towards the end of cooking? B. Save delicate herbs like parsley, cilantro, tarragon, chives, and basil for the last minute, or they will lose their fresh flavor and bright color. Hearty herbs, like thyme, rosemary, oregano, sage, and marjoram should be added early in the cooking process. 10. Which will give dishes a savory flavor? A. Soy sauce contains high levels of glutamates that give dishes a savory, meaty boost. Add a teaspoon or two of soy sauce to chili, stews, or soups to enhance them.